I love it when a restaurant serves food with consistency, satisfies my appetite, and does not leave me sickeningly stuffed or with the feeling of having been cheated out of an anticipated dining experience. Each time I have visited one of the Chipotle eateries, I have had a happy experience. The fresh ingredients Chipotle includes in their famous salad bowls and the care the owners take to help customers know exactly what they are eating, is commendable! Fresh food and a mixture of wonderful flavors is what they advertise and what they deliver. While I am not a spokesperson for Chipotle, I do love their food and my recipe for a chicken salad bowl, similar to theirs, is offered as a tribute to Chipotle! Lettuce: Chop Romaine lettuce coarsely and layer on serving plates or bowls. Set aside. Tomato Salsa: chop fresh tomatoes, add the juice from 1/2 lime per 1/2 C tomato. Add 1/2 chopped sweet onion, 1 T chopped fresh cilantro, salt and green chilies (canned), to taste. Mix well. Set aside. Rice: Add 1C Basmati rice (fragrant rice) to a pot. Rinse with cool water three times. Add water to cove rice 1/2 inch above rice level. Add 1 T butter and the juice from one lime. Put pot on med-high heat and boil until water is level with rice. Lower heat to low and pull pot almost off the burner. Cover pot and set timer for 10 minutes. Remove from heat and stir in 1 T chopped fresh cilantro. Mix well and fluff rice; cover and set aside). Black Beans:Open can of black beans and put in microwave safe container. Heat for 2 minutes and set aside, covered. Chicken: One chicken breast serves two. In a heavy pan, heat 1 T olive oil until hot on med-high heat. Braise both sides of chicken which has been sprinkled with smokey-pepper seasoning. Remove browned chicken from pan and place on cutting board. Slice chicken breast in 1/2 inch, crosswise pieces. Add back to pan and finish browning both sides evenly. Remove from pan and cut chicken into small chunks. Set aside. Assemble: Place lettuce on plate or in a bowl. Spoon warm, flavored rice down the center of lettuce bed. Add a generous spoonful of black beans. Top the beans with chunks of braised chicken. 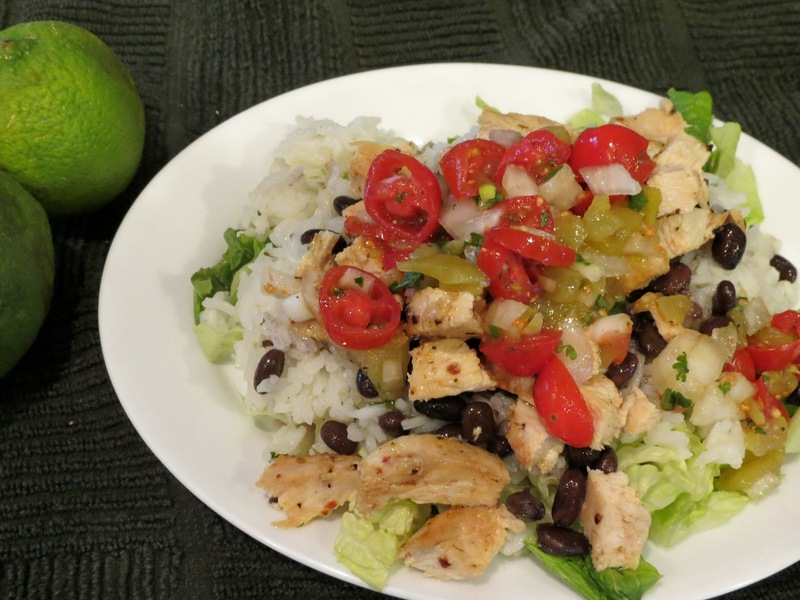 Lightly drizzle 1/4 C fresh salsa with juices across top of chicken and lettuce. Avocado and sour cream may be added. Serve immediately.